We are independent financial advisors. You may ask, "Why is that important to me?" You can feel confident knowing that the recommendations Larmann Financial provides to you are based on your unique needs. We are not obliged to promote any particular products, proprietary offerings or make referrals for other services. However, independence doesn't mean that we are alone. In the background, you have a network of organizations working for you. They operate quietly, efficiently and seamlessly in the background, making certain we can provide for all of your financial needs both now and in the future. 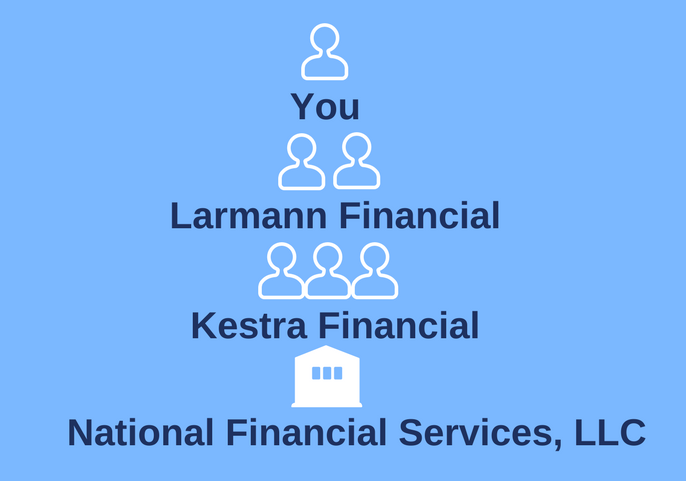 We have chosen to partner with Kestra Financial, our broker dealer, to provide sales, service and compliance support for us and our clients. We have also chosen National Financial Services, LLC, a Fidelity Brokerage Company, to serve as custodian for your investments. Your funds are never held by Larmann Financial, and you will never be writing a check to us. Partnering with these organizations, allows our clients to be confident and secure in the fact that there are checks and balances to ensure that their best interests are being considered and that each organization offers a level of surveillance for their safety.